The month of August, we believe, was one of the finest in the Group’s history as far as accuracy in bombing was concerned. In the first seventeen days, the Group flew 17 sorties, the majority of which were deep penetrations. After the seventeenth old “Jupiter Pluvious” raged and fumed, forcing our A/C to remain on the ground the better part of the remaining days. However, we did manage to put in four more sorties plus 3 AZON sorties, to run our record up to 24 sorties for the month. Our first mission of August 1, Sortie 100 was directed at 3 NOBALL INSTALLATIONS. Thirty-six of our A/C were airborne led by Major OLLUM [and] Captains WOODWARD (right) and BOOTH. 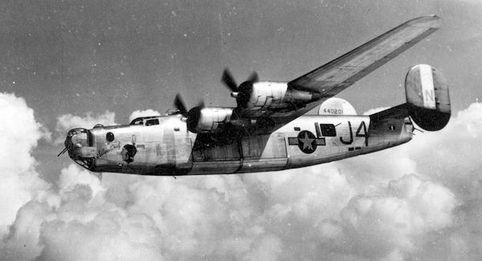 Poor weather prevailed over the assigned targets, and the formation bombed several targets of opportunity in France with unobserved results. Total bombs dropped 520x250 GP’s. On 2 Aug., another 3 NOBALL INSTALLATION target was out assigned task. Thirty-one of our A/C were over the targets led by Majors HENSLER and HINCKLEY, and Capt CLAGGETT. All three targets were hit with poor results. A total of 636x250 GP’s were dropped this day, Sortie 101 chalked up on sortie board. Assigned target for 3 Aug, Sortie 102 was two NOBALL INSTALLATIONS in France. Twenty-two of our A/C under the leadership of Lt Col SCHWARTZ and Major WILLIAMSON attacked the targets dropping 478x250 GP’s with fair results. A two-mission task was our assignment for 4 Aug, Sorties 103 and 104. The first mission attacked the HE 111 factory at ROSTOCK, GERMANY. Eighteen or our A/C were over the target led by Col ISBELL and Capt GRIFFITH dropped 186X500 GP’s on the assigned target with very good results. 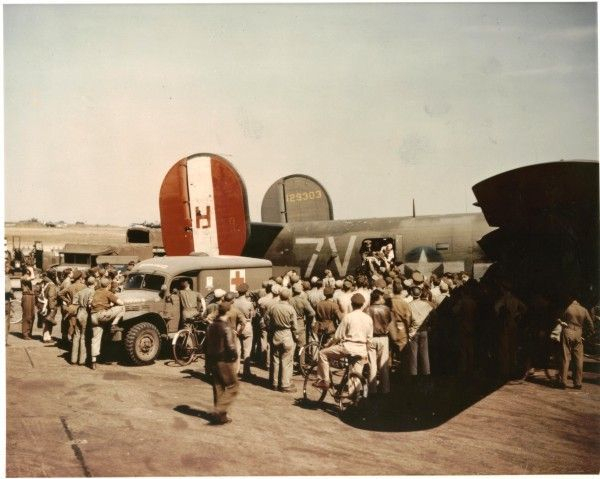 Our second formation of 12 A/C led by Major HENSON attacked ACHIET A/F in FRANCE, dropping 263x250 GP’s with good results. Another deep penetration fell our lot on 6 Aug, Sortie 106. The assigned target for the day was RHENANIA OIL REFINERY at HAMBURG, GERMANY. Twenty-one of our A/C led by Major O’NEILL and Capt CHAMBERLAIN (left) attacked the assigned target dropping 264x500 GP’s on the target with good results. 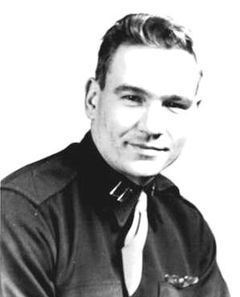 Our A/C 433 of the 755th Squadron [1Lt Thomas E. Hancock], flying lead in second section suffered a direct hit by flak on the bomb run to the target. The A/C exploded, wings fell off and A/C was seen heading for the ground enveloped in flames. (See MIA Section for names). An OIL REFINERY at GHENT, BELGIUM was our assignment for 7 Aug 44. The primary target was not bombed due to poor visibility, but 12 of our A/C dropped 566x100 GP’s on targets of opportunity with good results. Sortie 107 chalked up on the black side of the ledger. CLASTRES A/F, FRANCE. 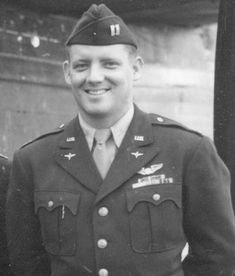 Sortie 108 was our assignment on 8 Aug. Twenty-seven of our A/C were over the target led by Major JAMISON and Capt WOODWARD, dropping 44.4 tons of GP’s with very good results. We were given a well-deserved rest on the 10th, but were out in force on 11 Aug, Sortie 110 to attack a RAILWAY FLY-OVER at STRASBOURG, GERMANY. Twenty-one of our A/C led by Major WILLIAMSON and Capt CLAGGETT, dropped 252x500 GP’s with the first section hitting the RR approximately 2000 yards SW of MPI, and the second section hitting the center of STRASBOURG. The A/F at MOURMELON, FRANCE, one of the largest in FRANCE, was our assignment on 12 Aug, Sortie 111. Twenty-one of our A/C led by Major O’NEILL and Capt WOODWARD, dropped 250x500 GP’s with good results. On 13 Aug, Sortie 112, we were called upon to assist the ground forces in their breakthrough in the LIEUSEY AREA, FRANCE. Twenty-two of our A/C attacked under the leadership of Majors HENSON and HINCKLEY, dropping 828X100 GP’s with good results. Another day when the Air Forces gave full cooperation to the foot sloggers on the ground, aiding them in their breakthrough on the road to BERLIN. The A/F at DOLE/TAVAUX was our assignment on 14 Aug, Sortie 113. Twenty-two of our A/C under the leadership of Captains BOOTH and GRIFFITH dropped 1056x100 GP’s on the air field with the following results: SAV’s show elongated pattern running along east edge of A/F and east dispersal area. Crews report good pattern in dispersal area in northern part of field. Another assault on the German held A/F’s in FRANCE was our assignment on 15 Aug, Sortie 114. Twenty of our A/C under the leadership of Major HENSLER and Capt GORRELL, dropped 76x1000 GP’s and 76x500 IB’s on the target with fair results. In the vicinity of MEPPEL an estimated 9 E/A attacked our formation using all kinds of tactics in their effort to destroy as many as possible. None of our A/C were lost, but our gunners succeeded in destroying three E/A, thus helping to further deplete the vaunted Luftwaffe. Another deep penetration fell our lot on Aug 16, Sortie 115. With our assault on A/C engine factory of JUNKERS FLUGZEUG, MAGDEBURG, GERMANY. Nineteen of our A/C under the leadership of Major JAMISON and Capt WRIGHT attacked the primary, dropping 227x500 GP’s with the following results: SAV of first SQ. 9 A/C show results poor, part of squadron dropping far short, others beyond target area. SAV of 2nd SQ. 10 A/C show results very good to excellent, blanketing MPI. A target new to us was our assignment on 18 Aug, Sortie 116, the AERO ENGINE FACTORY at WOIPPY, FRANCE. Twenty of our A/C led by Lt Col SCHWARTZ and Major WILLIAMSON, dropped 220x500 GP’s on Targets of Opportunity with unobserved results. For the next five days, weather forced us to stay aground, then on 23 Aug we were alerted to attack HANNOVER, but this mission was scrubbed owing to the persistent poor weather. It was not until the 24 Aug we were airborne again. This day the target assigned was the OIL REFINERY on the southern outskirts of MISBURG, 5 miles east of the center of HANNOVER. Thirty-one of our A/C led by Lt Col O’NEILL, Lt Col SCHWARTZ, and Capt WRIGHT, dropped 620x250 GP’s on the Primary Target with excellent results. On our mission to TERTRE, 12 of our A/C led by Major JAMISON attacked the primary, dropping 118x500 GP’s with excellent results. 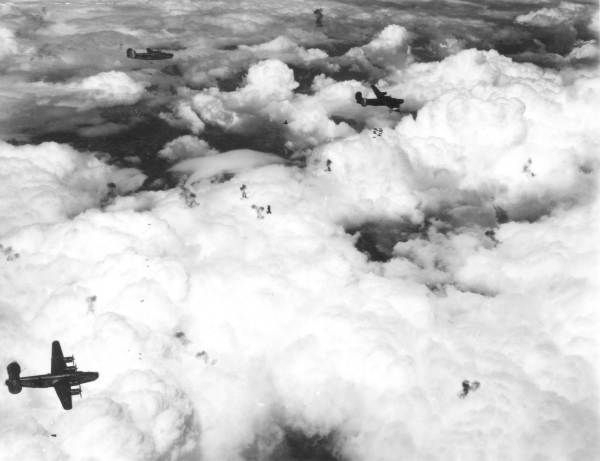 An all-out effort by the VIII AF on the oil industries of the enemy was successfully carried out on 26 Aug, with this Group taking an active part by bombing a FUEL DEPOT one mile east of DULMEN, GERMANY. Twenty-three of our A/C were over the target led by Capts SPEER and GORRELL, dropping 288x250’s and 28x100 GP’s on the target with excellent results, most hits being directly on the MPI.